Toy cupboard with "activity folder"
Full T&Cs will be forwarded with our booking forms. 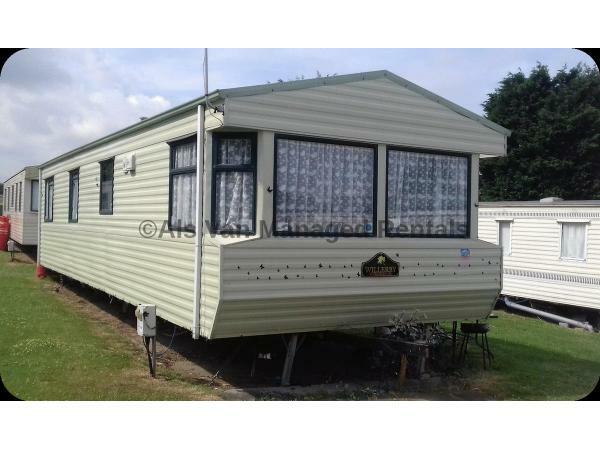 Beautiful 3-bedroom static caravan for holiday lets at Ashcroft Coast (Park Resorts), on the sunny Isle of Sheppey, SE Kent. Large living area, leading through to the separate dining area which has integrated seating + free-standing table & chairs. Separate, very well equipped kitchen including all the usuals + slow cooker, hand-mixer, foreman grill etc. The double bedroom has dressing table + wardrobes (+ TV! ), the 2 x twins both have wardrobes, nightlights etc. Shower room with DOUBLE-shower & separate W.C.
Garden furniture is provided: table, chairs, sun-loungers, parasol, plus new for 2018, we have outside “love-chairs” with a small table. Small outside BBQ for guest-use. Dogs are welcome: food/water bowls, furniture throws and outside tethers are all in situ. Please be aware Als Van is a non-smoking Holiday Home. Book direct on-line through our website, or message us for a personalised quote. Although this is one of Parkdean Resort's smaller sites, (compared to the likes of Camber Sands), Ashcroft Coast is Park Resort's "flagship" park for the island and has been rated a 4-star resort. It is also the ONLY Holiday Park on the island to have both indoor and outdoor heated pools! Be aware: Ashcroft Coast is pretty remote! It's strongly advised to have your own transport, as most surrounding attractions are a drive-away. The site is about a 5-min drive from both Eastchurch and Minster villages, around a 10-min drive from Leysdown and about 15-mins from Sheerness. The site has stunning views across the water, where the Thames Estuary meets the sea and from the back of the bar area, you'll be able to see across the water to the twinkling lights of Southend seafront! The beach at Ashcroft Coast is no longer accessible from the site, due to the steepness of the cliffs.The nearest beach is at Barton's Point which is about a mile and a half away from the site, there is a beach at Leysdown, along with a seasonally opening funfair, cafes and plenty of amusement arcades! Sheerness also has it's own beach, plus a large children's man-made sand-pit with various playground equipment in it, (years ago it used to be the town's boating lake! ), and if you're feeling brave - there is a naturalist beach just past Leysdown! No reviews found. If you have recently stayed in this holiday home please leave a review, it only takes a few moments and will really help future guests when they are searching for holiday accommodation at Ashcroft Coast Holiday Park.